Whenever I think of fool-proof makeup that lasts and provides complete coverage, I think of Estee Lauder’s famed Double Wear foundation. If you thought that was the last word on the subject, Estee Lauder now ups the ante with a new Maximum Cover Foundation! And as we head into the cooler and drier season ahead, you might also want to check out the new Flawless Hydrating Primer. Read more after the jump! Estee Lauder Double Wear Maximum Cover Foundation is a thick creamy foundation that is so pigmented it can cover scars, sun spots, birthmarks, even tattoos and varicose veins! A tiny pea-sized bit is all I need to cover my entire face! Although it feels quite thick initially, it is relatively easy to blend. I like to use a damp sponge or beauty blender and just dab at it. This way I can cover my entire face in a matter of seconds, and it leaves a more natural finish. Then for the more problematic spots that require greater coverage, I layer on more of the Maximum Cover Foundation with a concealer brush. Unlike the classic Double Wear Stay-in-Place, the Maximum Cover Foundation is not as creamy, and adheres better to the face like a veil. On my skin, it feels lighter and more comfortable despite affording greater coverage. No matter how hot the day gets, Estee Lauder Double Wear Maximum Cover never creases nor fades. I hardly notice any shine on my t-zone at the end of a long day, although my makeup does look slightly less matte and even more skin like. 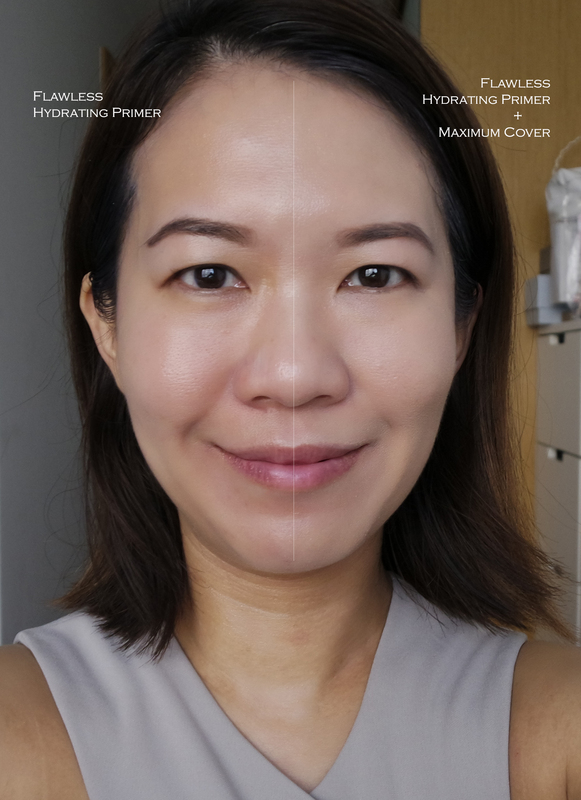 For those with very dry skin, I recommend properly hydrating your skin before using the Maximum Cover Foundation for the ultimate smooth finish. And to help you achieve this, Estee Lauder introduced the Flawless Hydrating Primer. This is a multi-tasking hydrating primer with high SPF45 to protect skin against broad-spectrum UV rays and pollution. It has a light fluid texture and it glides effortlessly over the face to create smooth even canvas for makeup application. This is the first primer Estee Lauder ever designed to specifically pair with Double Wear Stay-in-Place Makeup, though it works just as beautifully with any other Estee Lauder foundations. With these new launches, Estee Lauder has a complete foundation wardrobe to cater to each and every skin type and need. I have reviewed most of them over the years – check them out here. Do you have a favourite?